Hyperlinks, chain links, sausage links are some examples of different links. 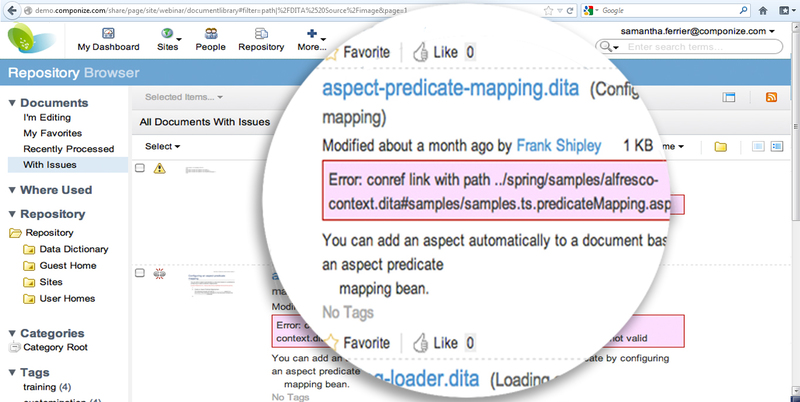 DITA XML is made of links, and keeping them straight is complicated. Componize knows how links work and keeps track of them for you. Link management has never been this intuitive. This results in links that are safe, robust and your content stays, well, linked. Links are essential to the DITA format. Maps contain links to topics. Topics may have links to images and videos, cross-references to other topics, related links, and references to phrases or single terms. With Componize, you’ll know what content is being used or where it is being used. Componize DITA CMS manages the links in your content: whenever you open, close, rename or move a file, all references to that file are automatically checked and updated. With just one click, check where an element is used and see the impact of your reuse strategy. Broken links are filtered and set aside for easy identification and repair. Filter your links by type: image, reference, content, etc. 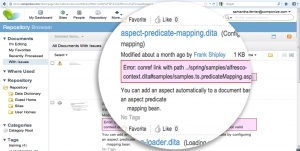 Componize is easily configurable to add support for new types of links. Link-to-link navigation is simple with end-to-end view. Extracted links for each document are stored in XLink format in a linkbase.